Sometimes the thing we fear most turns out to be a paper tiger. We run away and hide to avoid having to confront it – until we have no choice. When the moment arrives, when we summon up the courage to stand up to the beast, it shrinks to nothing. In The Giant Jumperee, a picture book written and illustrated by Julia Donaldson and Helen Oxenbury, Rabbit comes home one day and hears a loud, threatening voice coming from his burrow. “I’m the Giant Jumperee and I’m scary as can be!” the voice says. Rabbit runs to Cat for help, but the Giant Jumperee scares Cat as well. 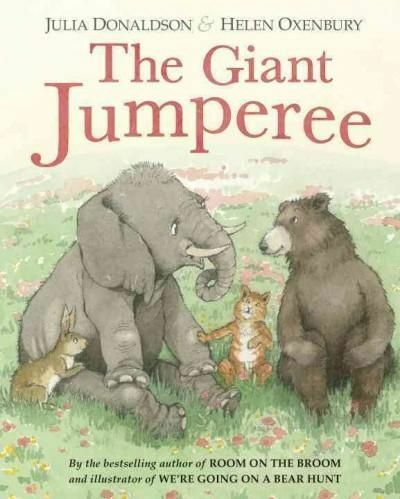 Even Bear and Elephant are too afraid to stand up to the Giant Jumperee. You will have to read the book to find out who the Giant Jumperee is, but I love the reaction of the other animals when he/she/it is finally revealed. I hope we can all learn the lesson our paper tigers teach us with the same disarming laughter and relief.